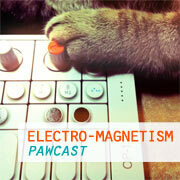 Mostly oldies but goodies in this week’s episode of Electro-Magnetism. Track 11 is a mystery- if you know the name of it or who its by please let me know. It was on this incredible compilation that a friend gave me that had no track listings. Over the years I’ve been figuring out all the tracks…its like a fun little game. And this is just fantastic. Must Find Copy ASAP.